Recently, those tags popped up again. Today, we finally activated the tags and attached them to little creatures. Perhaps I need to step back a second. Do you know what travel bugs are? 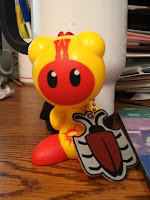 We were introduced to travel bugs early on in our geocaching career, but I am sure lots of you don't know what they are. If you don't go to the "Geocaching 101" page mentioned before and read "What are Trackables?". We, of course, have picked up Travel Bugs before. I've checked in on some of them from time to time and some of them that we picked up and then moved have been 10's of thousands of miles. A couple are now in Europe. It has always seemed really cool to see where they are going. Today, we started off our first Travel Bug on its journey. While I was registering it, I asked the kids what they wanted to name it, and my youngest immediately said "Guacamole". Big brother laughed and agreed that it was a great name. Apparently, both thought it was really funny. Not sure I get the joke, but both kids loved the name. We attached it to some cheap fast-food-kids-meal-toy we had in our geocache bag, and brought it out to Lair o’ the Bear Park. 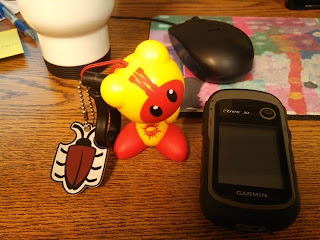 We had a couple nice sized caches loaded into our GPS and the plan was to drop our new Travel Bug into one of them. First up today, we found Kids castle cache. This was in a part of the park that we have not been to before. It ended up being a real easy find, although, it was laying out in the open, obviously not where it should have been. We relocated it to where we thought, based on the description, that it should be. We placed Guacamole into the container. Hopefully someone will pick it up soon and move it along. Fingers crossed, this is just the first of many stops for Guacamole. Then, we came to raspberry 2. This was also an easy find. 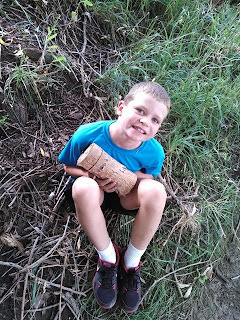 I sort of wish we had saved Guacamole for this cache, because the container is bigger and more sturdy. Guacamole would have been much safer and more comfortable here. But, hindsight is 20/20. It probably won't matter. After hitting these two geocaches, we hiked back to the minivan to pick up our lunch and headed to a picnic area by a tree that the kids love to climb. We had lunch and spent some more time in the park. Eventually, we headed back towards home. 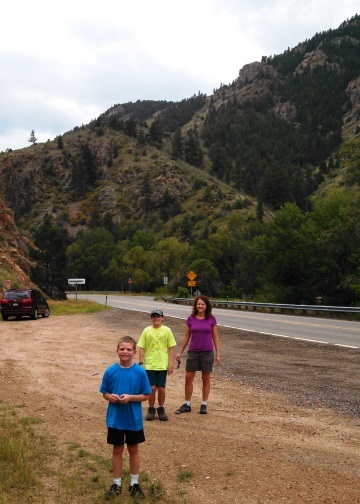 We stopped at a geocache along the side of the road. It was called East Idledale. This was also really easy to find for a quick cache and dash. We got home. While Big Brother was off with one of his friends and Mom was off at the grocery store, my youngest and I discovered a relatively new (new meaning I never noticed it before) cache on the rec-center bike path right behind our house. We went out and looked for Wooden It Be Nice? Again. We found this one pretty easily as well. It was not quite as easy as the first 3, but certainly not tough at all. The container for this cache was really cool. If you are in the area, I suggest checking it out. So the family was 4 for 4 today. It helps to have really easy ones, but I don't think we have ever gone 4 for 4 on a geocache day before. The kids are now real interested in setting up our own Geocache too. Not sure how to get that going, but I am sure I will let you know when/if we figure it out.